Lack of dependable elevator authority when trying to flare for a STOL landing at idle power has long been a problem for the 701. It’s necessary to hold considerable power right to touch-down in order to keep elevator authority. Cut the power and the nose drops suddenly, so you better be right close to the ground. Tuft testing in these photos shows how this happens. 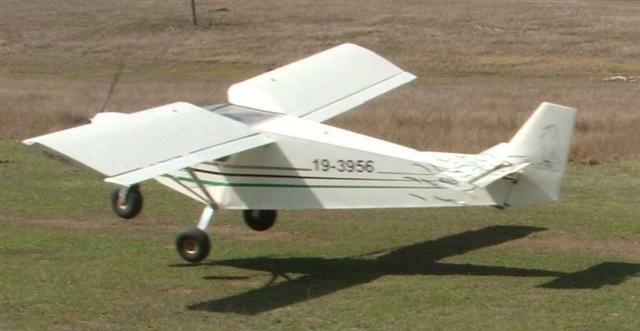 The airflow is still attached cleanly to the top of the horiz stab and deflected up by the elevator, allowing a high angle of attack for a good STOL landing. The airflow over the top of the horiz stab is detached and turbulent, so the elevator isn’t getting a clean airflow. Even more upward elevator deflection than the previous picture, but nowhere near the same AofA. 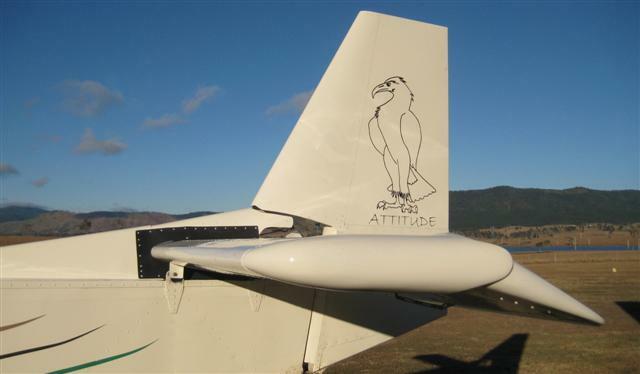 That unique inverted airfloil looks like a good idea when you look at a drawing of the aircraft at cruise attitude, but set it at a landing attitude and examine the airflow and it doesn’t make any sense. This photo is with the tail of the 701 held down to the landing attitude (note the angle of top surface of the horiz stab). The red arrow shows the airflow at idle power, which tuft testing has shown is parallel to the ground. 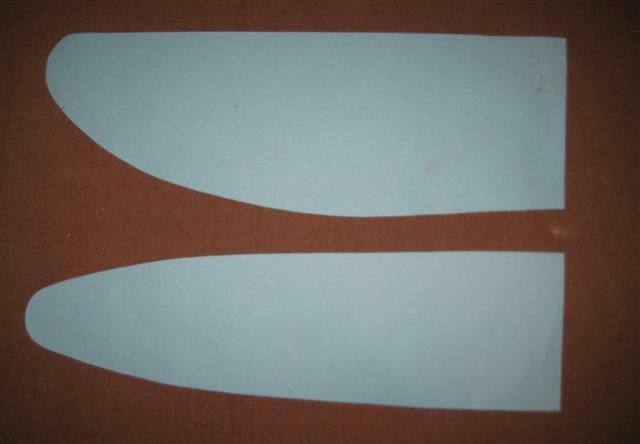 Now you can see how that ‘inverted airfoil’ becomes a problem. The airflow can’t remain attached over that sharp corner at the top surface, so goes turbulent as shown in the above tuft test, and is very disturbed when it reaches the elevator. 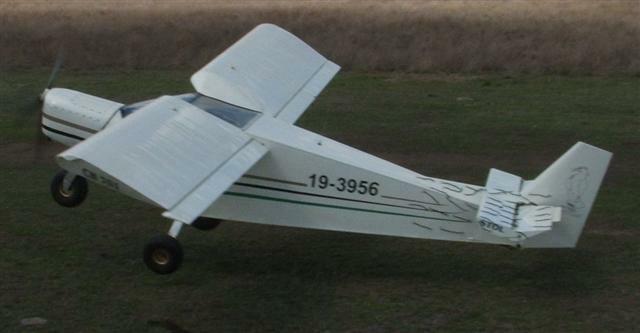 The airflow impinging on that bottom surface is very much deflected downwards, giving an up force on the tail, which is opposite to what we want.... And with the elevator held full up, as in the landing photos above, the airflow can’t remain attached to the underside of the elevator to give an airfoil effect. We were the first to apply VGs to the leading edge of the 701 elevator in order to help keep that airflow attached. At Oshkosh 2009 I noticed that the Zenith 701 demonstrator had Stolspeed VGs on the elevator. Since then Zenith manufactures their own VGs for this purpose. See 'Tail Feathers' at the end of this article. This is a Savannah horiz stab, with the aircraft held at the same landing attitude as the 701 above. Note how the airflow can ease over that top edge and stay attached all the way to the elevator, giving powerful elevator effect. The underside doesn’t deflect the airflow downwards nearly as much as that ‘inverted airfoil’. As a result, the Savannah elevator doesn’t need VGs at all, and can pull a high AofA at idle power with much less elevator deflection, so the airflow stays attached and consistent. The elevator on my Savannah is powerful, consistent, and dependable. I never need full deflection, even at idle power. But he still couldn’t match the Savannah, so finally he salvaged the horiz stab and elevator from a wrecked Savannah. (It had hit a car while trying to land on a private property, don’t ask more....) He found that it fit really easily on his 701, with only minor sheet metal and mounting bracket adjustments. He mounted it with an incidence of - 1º between the chord line of the horiz stab and the underside of the wing. It’s not easy to determine the true chord line of the main wing, so he used the flat area just behind the spar as the reference. The Savannah horiz stab is symmetrical, so the chord line is the mid line between the two surfaces. (So this is with the nose of the horiz stab 1º down as referenced to the underside of the wing) This turned out to be exactly correct, and he has neutral trim at cruise speed. The new horizontal stabilizer on Hans' 701. The results are very satisfying! Heaps of elevator authority at all power settings, including power off. And nice progressive linear control. Never needs anywhere near full up elevator. He can still drag it on with power like with the inverted airfloil, but with even better control at less power. And as a bonus, he gained 3-4 kts better cruise speed for the same power, as a result of eliminating all the drag of that original horiz stab. And an added bonus that can’t really be measured with numbers, it feels like he can now trim for more stable hands-off cruise. He’s thrilled with the improvement! Looking at the construction of the 701 horiz stab, it looks like you could make a new symmetrical section in place of that inverted airfoil, building on the existing spar. The spar on the horiz stab on the Savannah is 100mm deep, while the 701 is 106mm. 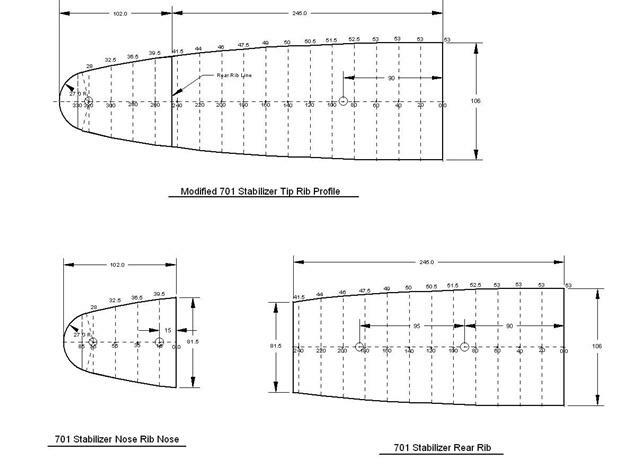 Below is the Savannah profile expanded to fit the 701 spar. This drawing was produced by Ron in Winnipeg, and is the pattern he'll use to form the ribs for his modified horizontal stabilizer. You just need to mount the ribs on the spar so that the mean chord line will be 1 degree down at the nose, referenced to the flat area on the underside of the wing just behind the main spar. The span of the horiz stab spar is the same on the Savannah and the 701, but the Savannah horiz stab and elevator have plastic end caps that extend 100mm each side, but with the rounded shape of these caps, I doubt that they contribute much to the effective area. They are probably mostly for appearance. The chord of the Savannah elevator is 60 mm longer than the 701. But judging that Hans never needs anywhere near full deflection with the Savannah elevator, the original 701 elevator is probably large enough. We’ve been working on that problem and have found a very effective fix! We tried VGs under the 701 horiz stab with moderate success, but then found that the very best effect was to place them near the leading edge of the elevator itself. In this position the VGs are hidden in the slot between the horiz stab and the elevator at cruise, but extend down into the airflow when the elevator is deflected up, as in the flare to a landing. This puts the VGs right in a high velocity airflow, just where they can be most effective. The result is a dramatic improvement in elevator authority! 'Tail Feathers' in the slot at cruise. 'Tail Feathers' exposed to the airflow at up elevator. These ‘Tail Feathers’ are a necessary addition to all 701 aircraft. There’s a great improvement in control and safety, with no downside at all. ‘Tail Feathers’ are even more beneficial for all those 701’s still with slats, since more elevator authority is required to pull the high AoA necessary for slats to become really effective. To order your 'Tail Feathers' go to the "Ordering Feathers VGs" page. Installed the Tail Feathers VGs on my 701 today. WoW! What a difference. At flair, I can now chop the throttle and hold AOA to touchdown. Don't need the power to land. I had another fly around yesterday with the VGs under the elevator. I put them on at 30 mm spacing as you suggested. Boy, does that make a difference! What a dramatic example of the effectiveness of VGs.